Early dog leash training can save you time, embarrassment and frustration. Take time to learn and teach a few easy steps and your dog will love you. Few things are more frustrating than a large dog pulling his master down the sidewalk. It is frustrating for the owner because he has completely lost control. It is also frustration for pedestrians who are trying to walk without being trampled by an out of control dog. Leash training a younger dog is much easier than training an old one, so start early and save the headache of trying to teach an old dog a new trick. Most dogs start pulling on the leash as soon as you put it on (on the dog, that is!). They are already anticipating their walk. Unfortunately, if the walk starts out of control, it can be hard to regain control. Therefore, the first leash training lesson is teaching your dog to be calm while you are putting on their leash. Tell her to "sit" and "be still." If she does not comply, simply stand there until she does. Once she learns that the walk will be postponed until she obeys, she will be more willing to sit still. If your dog has not yet learned to "sit" and "stay," then teach those first, without the distraction of a walk. When the dog finally learns to sit still while you are putting on their leash, he may then bolt for the door. 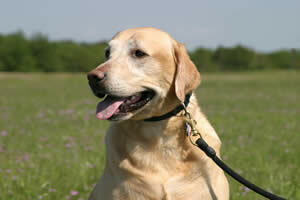 Regain control by holding the leash and not letting him go anywhere until he calms down. He will soon learn that the walk does not begin until he is under control. Once the dog is calm, praise him first and then walk a few steps. If he pulls on the leash, stop until he stands still. Every time he stops pulling on the leash, be sure to praise him. Once the dog is in control, you can proceed outside. First you should decide which side works best for you—left or right. Once the dog is on the correct side, give a chosen command for walking, such as "Let's go" or "forward." If the dog walks too far ahead and strains at the leash, stop and stand still until he also stops. Continue with this training until he stays at your side or slightly ahead of you while you are walking. His stride should match yours. Make sure to reward him with praise (or an occasional treat) when he complies with your leash training commands. Remember, this won’t happen overnight, but it WILL happen with consistent and frequent training. For hunters, it is more common for the dog to walk on the left side because guns are usually carried on the right shoulder, away from the dog. If you are showing your dog, it is more common for the dog to be on your left side, or on the side where the judge can most easily see the dog. Training your dog to walk or "heel" to the right or the left is a great idea. Why? If you have two dogs, one will need to walk on the left and one on the right. Consistency is just as important in training dogs as it is in raising children. If you do not always react the same way to his behavior, your dog will be confused. It doesn’t matter if you are leash training, teaching to sit or stay, potty training, or conducting any other type of basic dog training. If your training methods are consistent, your dog will understand that he always has to respond the same way to your commands. Consistent commands leads to consistent responses. Good doggy. You owe it to your dogs to take them for walks. Being cooped up inside a house or your back yard is like being trapped in a show ring, going around and around. Taking them for frequent walks will lead to a more stable, happy dog. It’s great for your own personal fitness, too! A well-trained dog is a joy to be around. Dog leash training does take some time and effort, but the results are well worth it.